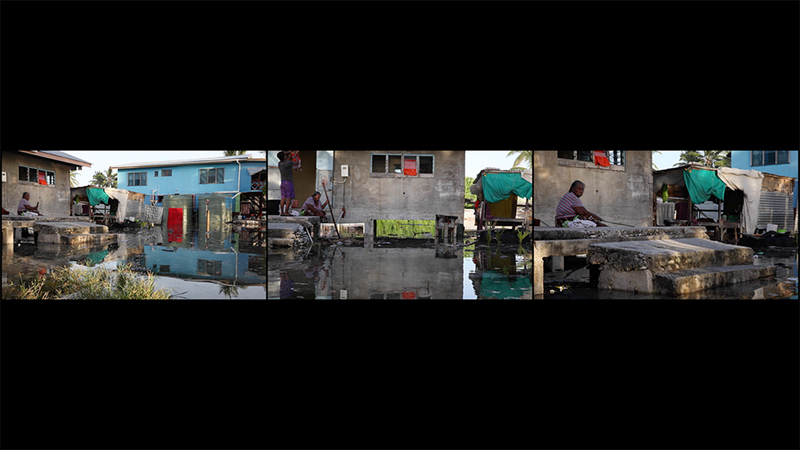 an exhibition concept; new media works reflecting the cultural identity, environmental, social and political issues that concern Indigenous communities in Queensland and the Pacific region. (Julietta Park the curator) approached two artists from Queensland and two artists from the Pacific to present works that explore the close cultural ties that exist between the two regions and the cultural, environmental, social and political issues that are shared between the communities. The Pacific is the canary in the global mine. We can see a glimpse of the challenges we may face in our collective future by looking at life in some of our smallest nations. Tiatia’s video captures the water bubbling up from below ground, the incoming tides and the debris that is brought with them. 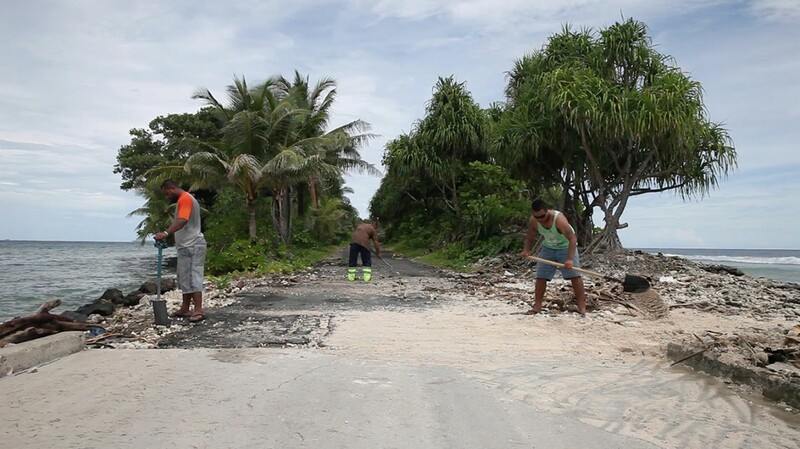 Council workers and locals clear rocks and garbage on a daily basis from the roads that run along the sea edge. Dead palm and coconut trees can be seen in some images, destroyed by the saline environment. The local airport’s carpark is filled to knee level and the water creeps on to the tarmac eventually covering it completely. There is no music in Tiatia’s composition, and this is a conscious decision by the artist to remove suggestive, emotive content from the documentation. Instead the soundscape is filled with local noises, silence and the island’s evening church bells calling the majority Christian community to prayer. Christianity has developed on the island mixing with a strong Pacific Islander heritage that is particular to Tuvalu. It is a unique culture and Tiatia’s video documentation acts also as a recording of a culture that seems to be facing inevitable annihilation. (Tuvalu) is a staggeringly beautiful place that has a complex culture stretching back thousands of years. But we are facing the seemingly inevitable prospect of losing Tuvalu over the coming decades as it gradually slips beneath the rising waters now bubbling from underground to the surface. This work is lament to what we are losing. 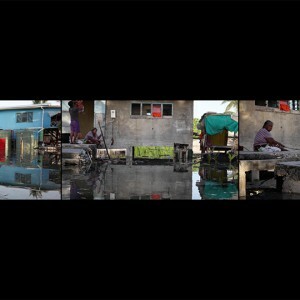 Tiatia extends her critical view of the environment and focuses on the effects of climate change on people’s lives, in Tuvalu, in the South Pacific. Her video directed audiences to witness a serious impact on their neighbor country, in Tuvalu, and to have a sense of urgency for their own land. In class activity – Students form into groups of 3 with one smart phone between them. Each group considers the word impact and the many ways it can be communicated visually. E.g the impact of two things meeting, the impact of falling over, the impact of a hard or gentle word, the impact of critical mass, the impact of sound. Students are asked to make a short 20 sec clip on their smart phone. These are then uploaded to computers that have simple editing software such as iMovie. As a group watch the different videos and then play with editing. Consider repeating one action multiple times, book ending one or two actions with another. Returning to small groups students work on a computer editing a video. Outcomes can be compared and discussion around different editing decisions and impact of those decisions can be had amongst the group. It was published in August 2017.